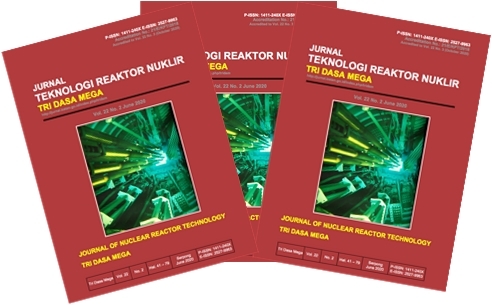 Jurnal Teknologi Reaktor Nuklir (Journal of Nuclear Reactor Technology) TRI DASA MEGA provides an international medium for the communication of original researches, ideas and developments in the field of nuclear reactor technologies and applications. Its scope embraces reactor physics, reactor thermal hydraulics, reactor instrumentation, reactor operation, safety analysis, and other fields related to nuclear reactor applications. The journal also publishes review papers that have a significant review element, which may take the form of a critique, comparison, or analysis. All papers should be written in a clear and concise American English. The submitted paper should follow the Template provided. Please also see our Writing Guideline for information on writing an article suitable for the journal. The journal is consistently published three times a year in February, June, and October by The Center for Nuclear Reactor Technology and Safety, National Nuclear Energy Agency of Indonesia (BATAN).